The Montana Department of Public Health and Human Services’ State Survey and Certification Agency administers the Nurse Aide Training and Competency Testing Program, while the Quality Assurance – Certification division maintains the Montana Nurse Aide Registry. A Certified Nurse Aide (CNA) training program can be completed in a short period of time. Montana laws also allow qualified individuals to challenge the state CNA exam. Certified Nurse Aides are in demand in the State because they provide important hands-on services that improve the quality of life for residents in a variety of long-term healthcare facilities. Following is a review of the procedures for becoming a CNA in Montana. Most people become a CNA in Montana by completing Certified Nurse Aide training and a State Competency Evaluation Program (state exam), or by showing proof of training and only taking the state exam. However, anyone can challenge the State Competency Evaluation Program in Montana, if they believe their prior training or experience qualifies them to do so. Following is a summary of the various paths to getting a name placed on the Montana Nurse Aide Registry and certification requirements. New nurse aides will normally complete a state-approved CNA training program and will demonstrate successful performance of all CNA skills listed in the Montana Nurse Aide Skills Competency Checklist (MNASCC) during a two-part state exam. Once all CNA skills are passed, the State Competency Evaluation Program (SCEP) is completed. Montana law also allows the waiver of completion of a particular skill due to a limited handicap, such as a hearing impairment. The person cannot perform that skill as an employee if the skill is waived. Individuals can take the state exam without proof of completed training in a Montana state approved program, if they believe they already have enough training or experience. They are allowed one attempt to pass the SCEP (state exam). If unable to pass the skills test in one attempt, it is necessary to complete a state-approved training program. Also, not getting a passing score on any particular skill means the person is not allowed to perform that skill in the workplace without supervision in the future. Out of state nursing assistants can request to be placed on the Montana State Nurse Aide Registry. They must provide proof of good standing on an out of state CNA Registry and attach a copy of their current certification notice to a Nurse Aide Registry Application form. Once verified, the person’s name is entered on the Montana Registry. 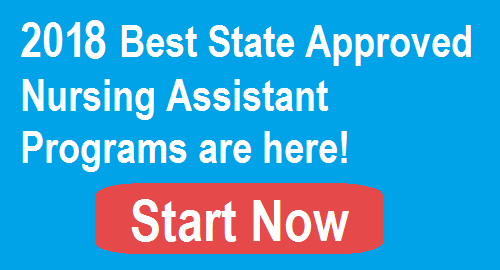 The CNA will also provide the employer a copy of the skills evaluation completed out of state, or the employer will verify the person has mastered the skills by administering the MNASCC. Nursing students who complete a Nursing Fundamentals class are considered qualified to take the CNA state exam in Montana. For those who choose to complete a state-approved training program rather than challenge the state CNA exam, the next step is reviewing and selecting a CNA training program. There are numerous options throughout the state with CNA programs in Montana offered at the University of Montana’s various colleges, learning centers, adult and community education centers, and community colleges. There are also many long-term care facilities, like nursing homes and hospitals, that also train students seeking CNA certification in Montana. In Montana there are 64 state-approved CNA classes. Find your local nursing assistant training program by using the following reactive school table. The school data is updated in November 2017. The schools at educational facilities that offer classes in Montana establish their own timeframes for program completion and set their own rates. For example, the course at Flathead Valley Community College consists of 105 hours of training and course lengths vary from one month to an entire semester. Tuition is charged based on the student earning five credits, and the per-tuition rate depends on whether they are an in-district or out-of-district student. In-district tuition and student fees are $812 (subject to change) for five credits. Plus the student must pay for the background check, immunizations, textbooks, scrubs and shoes, and a watch. The University of Montana offers CNA training programs at its various colleges around the state. Using Bitterroot College as an example, the Nurse Aide training program takes approximately five weeks to complete. It costs $1,200 (subject to change) for tuition and fees, textbook, CPR class fee, First Aid class fee, and state exam fee. The student must also purchase scrubs, a watch and miscellaneous supplies, and pay for a background check and immunizations. Some of the facilities offer a variety of financial aid options to assist with program fees. They include Vocational Rehabilitation Services Training funds for people with disabilities, Workforce Innovation & Opportunity Act (WIOA) Training Funding and a variety of local agencies and nonprofit tuition assistance funds. An important step every student should take is consulting with the school or program staff who are most familiar with financial aid opportunities that are available for people who want to become CNAs. Per federal and state laws, individuals can choose to train in a nursing home or other approved long-term facility while employed. Employment without certification is only allowed for up to four months (120 days). If the individual has not earned nurse aide certification once the 4-month period has passed, she or he is not allowed to continue employment in that facility or any other facility. This is an ideal way to get free training because the employer is responsible for covering all training costs. Nurse aides who are offered employment before finishing their training program or within 12 months of certification can also get training costs covered by state. The costs are prorated based upon the number of months out of 12 the individual is employed. There is no state age requirement to enroll in a course. High school students can attend a CNA training program in Montana. However, there is a state law that requires individuals to be at least 18 years old before they can be hired as Certified Nurse Aides. Timing training completion can prevent a long period between the end of training and employment. The CNA training program curriculum teaches students what they need to know in order to provide high quality basic nursing services to clients in Montana. The Nursing Assistant courses consist of classroom, laboratory and hands-on clinical training. A state approved program must be a minimum of 75 hours of training, consisting of 45-50 classroom hours and 25-30 clinical or practical (lab) training hours under supervision of a Registered Nurse (RN) or Licensed Practical Nurse (LPN). However, many of the CNA courses require a greater number of hours to complete. During training, qualified healthcare professionals may provide training in their specialty fields as part of the curriculum, i.e. physical therapist, social workers, dieticians, etc. SA has contracted with Headmaster – D&S Diversified Technologies to administer the state’s competency evaluation program or state CNA exam. D&S Diversified Technologies has regional test sites which are listed on the Headmaster website. The Knowledge Test consists of 72 multiple choice questions. The tester must earn a score of 75 percent to pass. Five (5) selected skills are tested, and evaluation of the individual’s communication and interpersonal skills is included as part of each CNA skill. Handwashing is always the first skill and the other four skills are randomly chosen. The tester must earn a score of 80 percent on each of the five skills to pass. If unable to pass both parts of the SCEP in three attempts within six (6) months of completing training, the individual will have to complete a nurse aide training program and then retest. Anyone who did not complete a training program and decided to challenge the exam gets one attempt to pass. If unable to pass the SCEP on the first attempt, the person will have to complete a training program and then gets three attempts to pass the SCEP. The SA maintains the Montana Nurse Aide Registry. Headmaster will notify the Registry after an individual passes both parts of the CNA state exam. A nurse aide certification period is one year (12 months). To renew certification in Montana, the Certified Nursing Assistant needs to work for wages as a nurse aide for at least eight (8) hours within the 12-month certification period. The certification is renewed every 12 months from the last date the CNA worked eight hours providing nurse aide duties. An employer provides, in writing, employment verification. If employer(s) cannot provide verification of employment, the nurse aide will have to complete a NATCEP or challenge the SCEP. Challenging a state exam means asking permission to take the exam without additional training.